It is generally believed that around 1 out of 255 women and 1 out of 12 men may have some degree of color blindness. How we perceive color has the possibility to change how we perceive things. 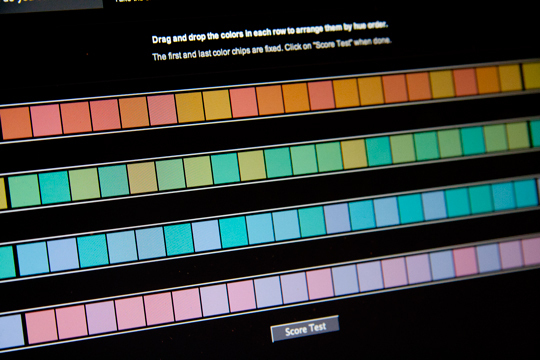 To take the test, your are presented with four rows of color swatches. Drag and drop the swatches in the order that most seems correct, transitioning from one color to the other. On a scale between 0 and 99, with 0 being Perfect Color Acuity and 99 being Low Color Acuity. I rated an 8, which is very close to Color Acuity, but I think I could have/should have done better. 62 here. Where did you find this thing? It’s intriguing. I’ve seen this before, but never taken it for two reasons. 1) the color resolution of monitors varies enough, I don’t entirely trust the results, and 2) I’m already well aware I’m red/green color blind. @Mom: Wow. I didn’t know you were THAT color blind! @Mike: 62? Hence why we don’t let you pick out colors for things. @Martin: It’s less about the color output of the monitor (and whether it’s calibrated, etc), and more about seeing the shades and how they progress from point A, all the way to the left, and point B to the right. Brian, I realize that may be partly true. But I still know I don’t need to take it to know that I’m red/green color blind! Sadly, this means many people think a fire truck looks green to me. Um. No. Note that the test is dependent, at least in part, on the ambient light and your screen sensitivity, not just your visual perception. Don’t beat yourself up too much if your score is not perfect, folks. And Brian, hugs and smoochies to you.